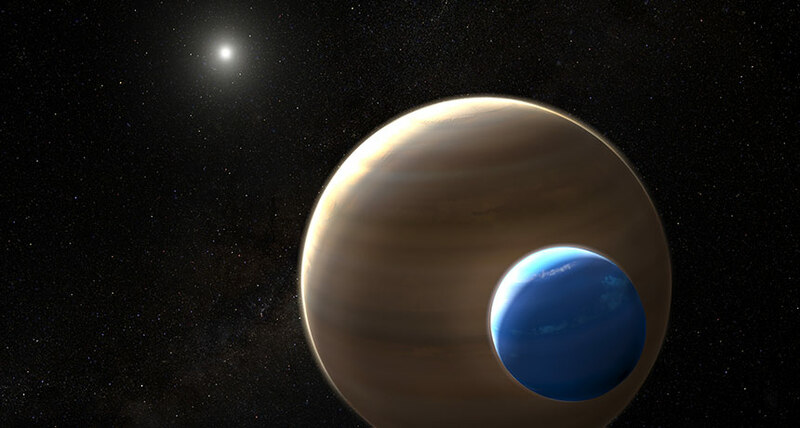 IN AND OUT OF VIEW A glimpse of a possible Neptune-sized exomoon around a Jupiter-sized exoplanet (shown in this artist's illustration) is proving hard to confirm. SEATTLE - A good exomoon is hard to find. Proving that the first purported moon around an exoplanet actually exists could take up to a decade, its discoverers say. "We're running into some difficult problems in terms of confirming the presence of this thing," said astronomer Alex Teachey of Columbia University at a meeting of the American Astronomical Society on January 10. Using data from the now-defunct Kepler space telescope, Teachey and his Columbia colleague David Kipping revealed in 2017 that they had found the first hints of a moon orbiting a planet a little bigger than Jupiter around a star about 8,000 light-years away . Then in 2018, the pair reported that data from the Hubble Space Telescope bolstered the case for the moon's existence, but didn't confirm it . That uncertainty is partly because the purported moon seems to be about the size of Neptune, much larger than moon formation theories predict. And the researchers can't rule out that the evidence of the moon isn't actually evidence of a second planet. "We're trying to be very careful about not calling this a discovery, that we've got this beyond a shadow of a doubt," Teachey said. The team won't be using Hubble to search for the moon again, after the committee that allocates Hubble's observing time denied additional search time during the next window of opportunity in May. While disappointing, Teachey says the decision makes sense. Without knowing precisely when and where the moon will show up, the probability that the telescope will yield more conclusive evidence of the moon's existence is not high enough. Ground-based telescopes are trying to confirm if the object is a moon or a second planet based on the object's gravitational tugs on the known planet. That's a much slower process than looking for dips in light from exoplanets and exomoons passing in front of their stars, which is what the Hubble and Kepler data reveal, and could take five to 10 years, Teachey says. "Everything is suggesting that we're going to need to be patient," he says. "If it's really there, it's really there." Meanwhile, he and Kipping are still looking for other exomoons in the Kepler data.